We are an independent restaurant and rely on reservations being honoured to ensure our continued success. Therefore we kindly ask that if you need to make any changes to your reservation that you do so as soon as possible. We require credit card details to secure reservations for Friday & Saturday evening (from 5pm) and all group bookings of 6 or more guests. These details are kept securely with a third party provider (Stripe) and will only be charged in the event the cancellation terms are not met. We ask for 24 hours notice of a cancellation or reduction in numbers: failure to give this notice will automatically incur a £15pp fee. We will email you a booking reminder 2 days before your booking. We politely ask you to contact us if you are running late as we can only hold tables for up-to 15 minutes and will release it if we have not been contacted. By making a reservation with us you agree to our reservation cancellation terms. 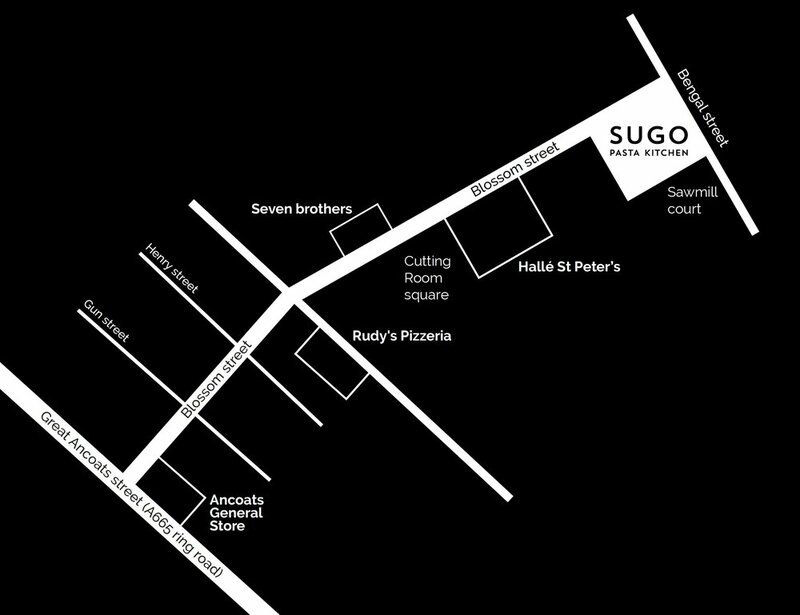 We look forward to welcoming you to Sugo Pasta Kitchen.